The 25.91 metre motor yacht Halcyon Days has switched central agencies and is now listed for sale by Whit Kirtland at Northrop & Johnson. Halcyon Days was delivered in 1986 and has subsequently been refitted in 1990 and 2007. Constructed with a steel hull, she was built by Dutch yard Jongert to Germanischer Lloyd standards. Designed with a classic interior by Peter Sijm, and exterior by Sparkman & Stephens, she sleeps up to 11 guests in five cabins. All guest cabins are ensuite, and the owner’s marble lined bathroom includes an oval bath. The VIP guest cabin features a media and study room with plasma screen television and DVD player. She can also accommodate two crew members. Halcyon Days has been designed for comfort when cruising long distances. Her elegant teak panelled saloon features a comfortable dining and living area, as well as a sapele inlaid bar and concealed entertainment centre, ideal for relaxing underway. Her spacious deck includes a dining area for 12 people. The large flybridge is designed with padded areas ideal for sunbathing, and there is storage below for a five metre tender and Jet Ski. This yacht for sale is powered by twin Caterpillar engines, installed in 2004, and has a cruising speed of nine knots. She can reach a top speed of 11 knots. 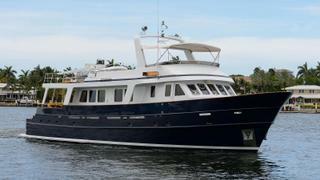 Lying in Fort Lauderdale, Florida, Halcyon Days is asking $899,000.